Click here to return to Mt Hawley Animal Clinic ! With the holidays coming up, it is always a good idea to review some good practices when it comes to your pets and decorations, food, and spirits. 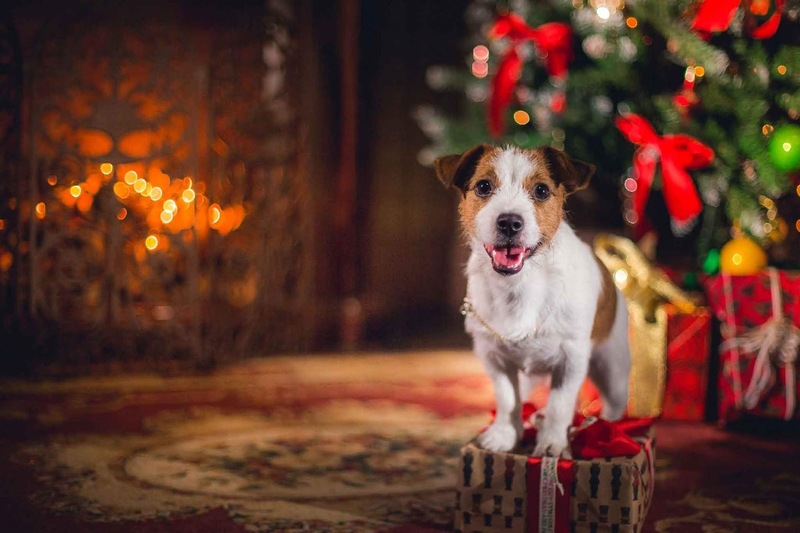 Even the best behaved pets can be tempted by the holiday cheer, so taking preventative steps to avoid an unhealthy interaction is always a good idea. Christmas trees: Trees can pose multiple risks to pets. For cats, tinsel on the tree can be tempting to chew on, along with the needles. Trees can also pose a fall risk if a dog or cat gets too rambunctious and jumps on the tree. In addition, for live trees the water in the holder/basin can become ripe with bacteria/molds that may cause stomach upset. Lights: Lights are pretty to look at, but can be too tempting for some pets. If your pet is prone to chewing on things, make sure that the wires are hidden away or covered. Protective wire covers can be purchased to give some protection from pets chewing. Candles: Open flames and pets typically don’t mix, so it is best to leave these un-lit and consider a plug-in scent to get you in the holiday mood. Candy: While most pets can handle a little milk chocolate, getting into a bag of candy can cause considerable stomach issues. If baking, make sure that any Baker’s chocolate is stored away as this can cause life-threatening problems to dogs due to the high methylxanthine and caffeine content. Also, make sure to avoid in foods with the sugar substitute xylitol, as this can cause severe liver issues in dogs, even with small amounts. Alcohol: Humans may not be the only mammal in the house that enjoys an adult beverage. 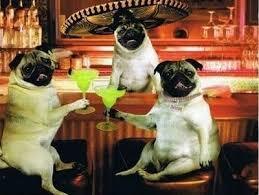 Make sure to pour out any half-empty cocktails to ensure your pet doesn’t sneak a drink. Fatty foods: Make sure any left-overs are carefully stored away, so your dog doesn’t become a living garbage disposal. Foods high in fat can cause significant gastrointestinal issues, so keeping these away from your animals will prevent you from cleaning up a different holiday mess. If your pet does happen to get into something they shouldn’t, you should contact your veterinarian immediately to see whether it is something to worry about. If it is after hours, there are a couple good pet poison control resources available at either ASPCA Animal Poison Control Center, (888) 426-4435, or the Pet Poison Helpline, (855) 764-7661. There may be a fee associated with speaking to a veterinary technician or veterinarian if calling one of these poison control hotlines. Just like with people, pets are prone to aches and pains as they get older. Many times the underlying culprit is osteoarthritis. With arthritis, the cartilage within the normal joint breaks down, leading to abnormal rubbing of bone resulting in inflammation and pain. Sometimes this occurs early in life secondary to an underlying conformational problem like hip or elbow dysplasia, but many times it is a result of getting older. A thorough physical examination can help pinpoint which joints may be causing a problem for a pet and then x-rays can be taken to confirm arthritis. If your pet is diagnosed with arthritis, there are a wide variety of treatments ranging from weight loss to medications to physical therapy. A wide variety of medications are available to help ease the inflammation and pain associated with arthritis. There are numerous over the counter supplements available that aid in arthritis relief. The two most common supplements are omega fatty acids (fish oil) and glucosamine/chondroitin. However, the mainstay of treatment typically revolves around non-steroidal anti-inflammatory medications (NSAIDS). Fish oil contains high amounts of omega fatty acids, which are beneficial in reducing inflammation associated with arthritis. Specifically, the omega 3 fatty acids, EPA and DHA, are the most helpful in arthritis. Ideally, a pet should receive between 50-100 mg/kg of EPA to help with arthritis. Supplementing with glucosamine can give relief to some pets. These medications help decrease the inflammation within the synovial fluid of the joint and can help decrease cartilage degradation. There are numerous oral medications available like Cosequin and Dasqauin, along with an injectable form called Adaquan. There are also prescription foods that have added glucosamine and omega fatty acids, so additional supplementation is not needed. A couple examples of food are Science Diet J/D and Royal Canin Mobility Support. Which brand of NSAID that your pet is started on depends on your veterinarian, how often you can medicate, and what your pet tolerates. Every pet is different and may respond to one NSAID over another. These medications typically are tolerated well, but stomach upset or ulceration can happen and kidney and liver values should be checked every 3-6 months if your pet is taking them regularly. NSAIDS are used very commonly with dogs, but the use in cats can be controversial. In 2010, a black-box warning was added to metacam in the U.S. stating that it can cause acute kidney failure and death in cats. It is only labeled for one time use with post-operatively pain in the U.S.; however, It can still be used off-label for chronic pain. In the U.K. it is used very frequently in cats suffering from osteoarthritis without major complications and can be used successfully in cats by adjusting the dosage and monitoring kidney values. Having a thorough discussion with your veterinarian prior to starting your cat on meloxicam is recommended. Recently, a new class of medications called the Piprant medications have become available to help with arthritis. These medications target the receptors of prostaglandins instead of production to control arthritis pain. Currently, only one medication (Grapiprant) is available from this class. This is a regenerative therapy that uses fat from a patient and processes it to acquire stem cells. To collect the fat, general anesthesia is required and the fat is then sent to a laboratory for treatment. There are also some in-hospital kits that are available and allow for processing without sending the sample out. This is a newer therapy and while it has been shown to benefit patients with arthritis, it hasn’t been compared head to head with other therapies. 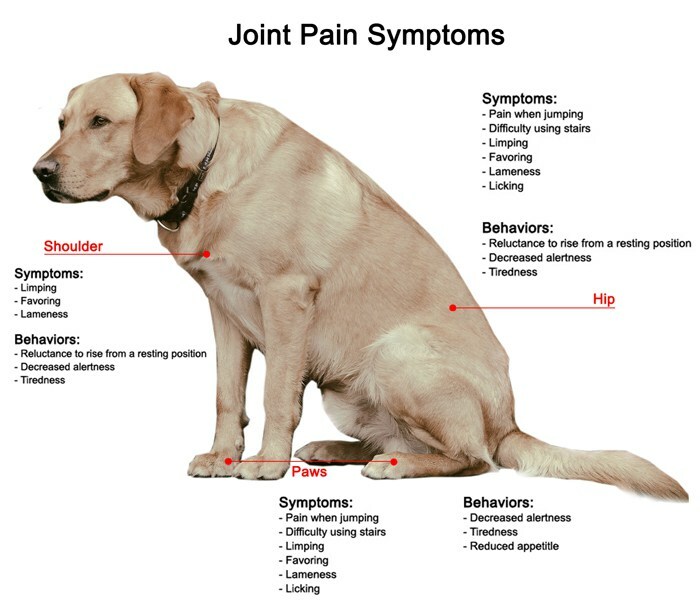 As noted above, there are numerous options to help control arthritis pain in pets. Having a discussion with your veterinarian about arthritis concerns in your pet is the first step in the road to arthritis pain control. It's finally warming up in the Midwest and with that the concern for algae blooms in lakes and streams is increasing. While I don't want to cause undo alarm since toxic algae blooms are fairly rare, I do want to make people aware that a potential threat for your pet can be in your backyard. What causes algae to be toxic? 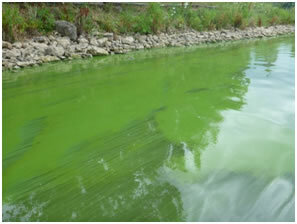 Blue-green algae, also known as cyanobacteria, can reproduce rapidly in lakes and streams when they are exposed to the right temperature, sunlight, and nutrients. A lake can go from clear to green in a matter of days when exposed to the right conditions. Algae tends to form in warm, shallow, undisturbed water with lots of sunlight. Most algae are non-toxic, but some can produce toxins that can make pets seriously ill and lead to death. The two most common types are toxins are neurotoxins and hepatotoxins. Neurotoxins are quick acting toxins (within 15-30 minutes of exposure) that attack the nervous system and can cause muscle cramping, twitching, paralysis, and cardiac arrest in dogs. Hepatotoxins typically take longer to act and symptoms may not show up until a couple weeks after exposure. These damage the liver and can cause nausea, vomiting, and sudden liver failure. How do I to tell if algae is toxic? Toxic and non-toxic algae can look very similar and may only be discernible using a microscope in some situations. That being said, if algae is filamentous it is unlikely to be toxic. Filamentous algae will cling to a stick if it is run through the algae. 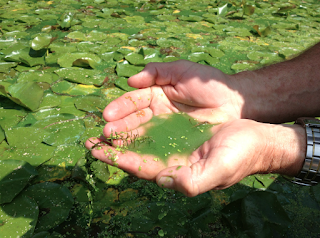 If the algae is non-filamentous than it has the potential to be toxic. This type of algae will look like blue, green, or even red or brown paint is spilled in the water. Multiple types of algae can grow in the same lake, so don't assume that the algae is safe even if one area is filamentous. If you suspect that a lake or stream near you has toxic algae, contact your local environmental health section of your health department for them to come test the water. What if I suspect there is toxic algae near me? If you are suspicious that there is toxic algae near you, then treat it as toxic until proven otherwise. Keep pets away from the lake and do not allow them to swim or drink from the water under any circumstances. Also, keep any humans (adult or children) away from the water as the toxins can also affect people causing skin rashes to serious sickness if ingested. If you have concerns about algae blooms in Illinois, contact the Surface Water Section of the Illinois EPA at 217-782-3362. If your pet is exposed to toxic algae, treat it as an emergency and have them evaluated by a veterinarian as soon as possible. 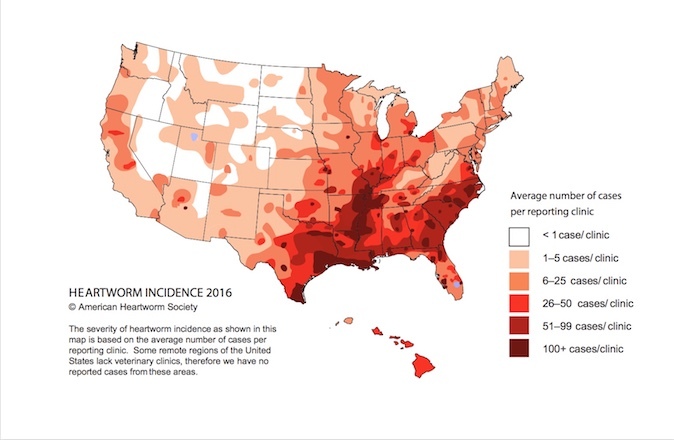 Spring is finally upon us, so it is again time to refresh our understanding of Heartworm Disease (HWD). As the name implies, HWD affects the heart. It is caused by an infection with a parasite called Dirofilaria immitis, which is passed between animals by mosquitoes. What happens is mosquitoes will feed on an infected animal (typically a dog, but also coyotes, foxes, and cats); where they will pick up younger stages of the parasite called microfilaria. Over the course of 2 weeks, these microfilaria will grow into young larval stages of the parasite, then the mosquito will feed on your pet and transfer these young stages into your pet. 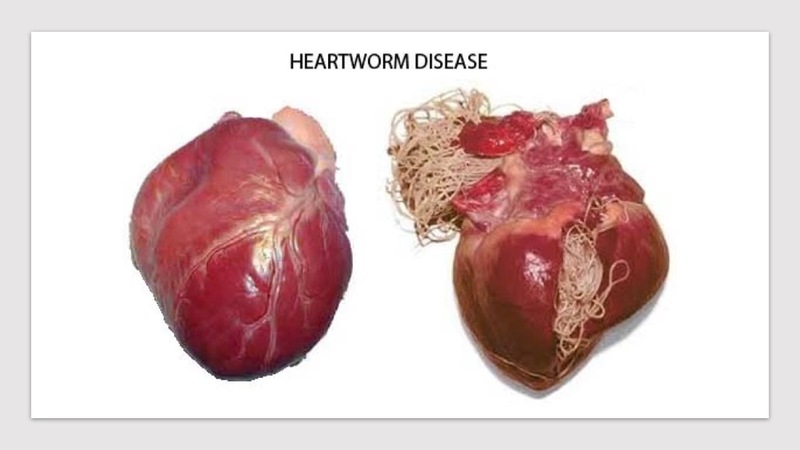 During the next 6-7 months, these larva travel throughout the body growing into adult worms, which ultimately reside in the right side of the heart (pulmonary artery). Here, the adult worms will mate and produce more microfilaria, completing the life cycle. The worms in the heart cause problems by blocking the flow of blood through the vessels and by causing inflammation in the lungs when the body tries to clear the infection. The infection can range from just a couple worms, which may not cause any clinical signs, to hundreds of worms, which prevent proper blood flow causing weakness, coughing, and difficulty breathing. The best way to combat the disease is to prevent the infection in the first place. 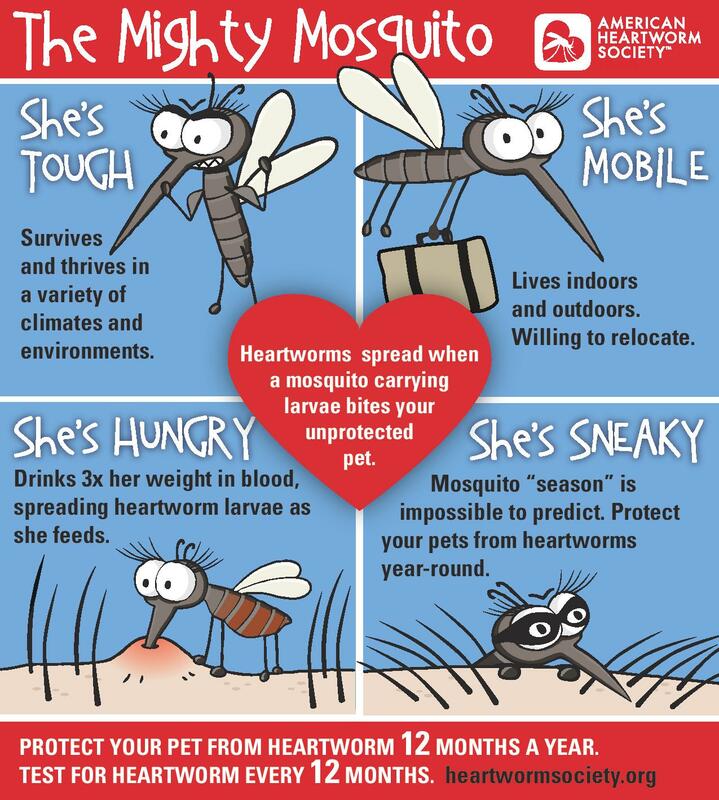 There are two main ways of doing this: limiting exposure to mosquitoes and using heartworm prevention medications. 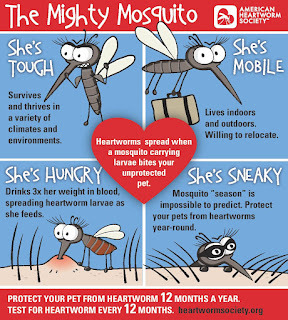 Most species of mosquitoes are most active during the dusk hours, so limiting your dog from going outside during these times can help. Also, there are topical products that can be applied to your dog’s skin that help repel mosquitoes (Vectra, Advantix), as well as environmental treatments and clean up (prevent standing water) that can be performed. There are also many HWD prevention products. The range from oral medications (Heartgard, Trifexis) to topical medications (Revolution, Advantage Multi) to injectable medications (ProHeart). Most of the products are administered or applied monthly and work by killing the larval stage of the worm before it can grow up into an adult. Although there have been reports of lack of efficiency in many products, by-and-large these products are very effective. It is important to follow the label accordingly when giving these medications (with or without food, no bath before applying topical meds, etc) in order to make them the most effective. It is also recommended to test your dog for HWD yearly. There are many bench-side tests that can be performed on a blood sample to check whether your pet is heartworm free. 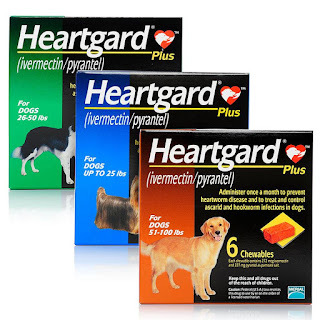 Even if your pet is on continual heartworm prevention, it is recommended to screen them for infections since, even though rare, there have been reports of lack of effectiveness. Some companies will help pay for heartworm treatment if your pet becomes infected while using their product. 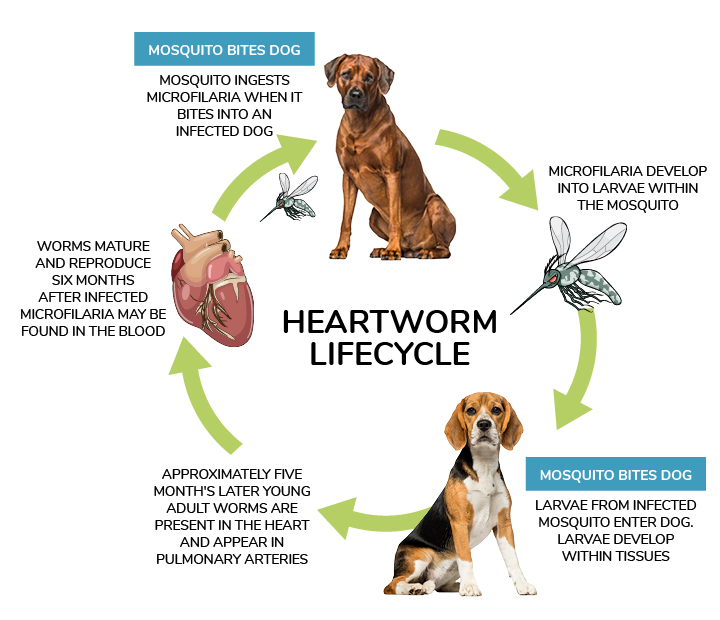 If your pet does somehow become infected with heartworm disease, there is still a treatment available to clear the infection. Most veterinarians will recommended treating with an injectable medication called Melarsomine. A series of 3 injections are typically performed over the course of a month. There can be serious complications associated with treatment, so it is important to prevent the disease if possible. Periodontal disease is the most common disease in dogs and cats. Since most pet’s teeth do not get brushed daily, plaque can accumulate quickly on the teeth. Plaque contains bacteria, which can make its way under the gums and down the root of the tooth leading to periodontal disease. Toxins released by bacteria cause destruction of the gums and bone surrounding the teeth which leads to oral pain, loose teeth, and bad breath. In early stages (red, puffy gums) the affected teeth may be saved, but later stages of periodontitis can lead to extraction of teeth. The best way to prevent dental disease is routine dental care at home. Just like with people, brushing your pet’s teeth is the best way to prevent plaque accumulation. It can take some time training your pet to be comfortable with brushing his/her teeth. 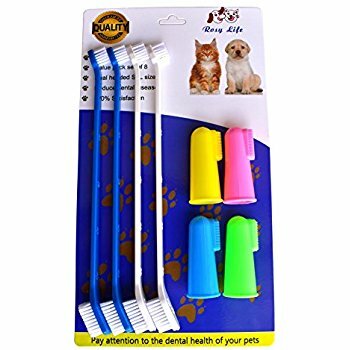 If your pet is resistant to tooth brushing, start by rubbing around the muzzle and face while rewarding with treats and praise. After a few days, move on to lifting the lip and rubbing the teeth with a soft rag; again, while rewarding with treats. Once your pet is comfortable with this, then you can move on to using a tooth brush with an enzymatic tooth paste. Brush the teeth in a circular motion focusing on the upper canine teeth and upper cheek teeth. Even with the best of care at home, most pets need a periodic cleaning in the clinic. Dental cleanings for pets are similar to when humans go to the dentist. One of the main differences, though, is that pets must be anesthetized to perform the cleaning. This not only keeps the pet safe and allows a thorough cleaning, but also keeps the staff safe from a possible bite wound. The teeth are first cleared of calculus and plaque using a scaler (typically an ultrasonic scaler). Then, the teeth are probed along their gum surface to look for any large gingival pockets, which indicates periodontal disease. Dental x-rays may be performed as well. If any teeth are unhealthy, then these teeth are treated appropriately or if the tooth is too far gone, it is extracted. 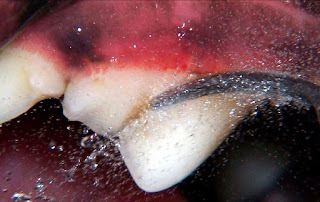 The teeth are then polished and fluoride or a sealant is applied to the teeth. Depending on the amount of home care performed, pets may need in-clinic cleanings every 6 month to 2 years. February is National Pet Dental Health Month, so in response we are offering 10% off dental cleaning in our clinics.